Sub 10 BRHP is a bass reflex subwoofer equipped with a Mivoc AWM 104 bass driver and a high pass filter for further bass accentuation (BRHP denotes bass reflex high pass). 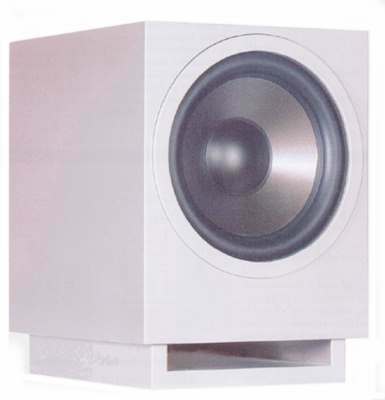 To achieve this a Mivoc AWM 104 is combined with an AM 80 MK II amplifier module. A 1500 uF capacitor proved to be the best choice in the signal path. In general, a capacitor is a high pass filter, prohibiting that low frequency signals reach the driver, but with a complex impedance (impedance and phase) it also acts like a transformer, amplifying and adjusting the lower frequencies (theory on bass accentuation with a capacitor as in "Sealed Cabinet with High Pass (GHP)").